-This is the prequel to Symphony of Eternity. The story is very simple as you begin the game, and within a few minutes the plight of the people is revealed. Evils are threatening the world, and various races all band together against the Evils. You’re instantly told of the main character’s background and his reason for taking up arms against these creatures. His destiny is unknown until the castle is attacked and he unknowingly activates a golem that may be the key to the world’s salvation. Ryle is the main character and the one behind the activation of the Golem. He can be ridiculously irritating and ‘loud’, yet his personality and character grows on you as you continue to play. His relationship with the Golem is the highlight of many scenes, and it is executed very well. 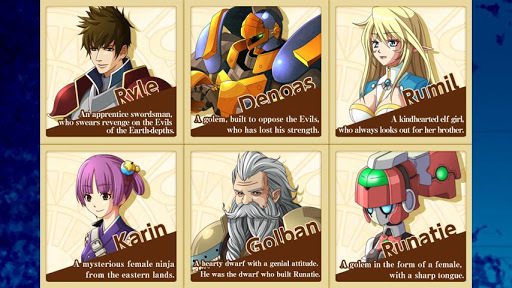 The other characters are what you would expect from an RPG. Each character follows a stereotype, and is molded in a certain fashion that is very traditional in the RPG genre. This results in an interesting cast of characters that are very memorable. There are countless moments where you may find yourself laughing out loud, and looking like a complete nutjob to everyone else around you. The cast and jokes may be overemphasized or seem a little irrational and forced, but that does little to take away the amusement of it all. A particular scene that illustrates this is when Ryle tries desperately to figure out whether a particular character is male or female. This was very satisfying, and it was wonderful to see a game make fun of itself and its characters in such a lighthearted way. The only complaint I have regarding Characters and Dialogue may be due to the translation and written dialogue. There are times when certain words are used repetitively, or incorrectly. The dialogue blunders distract you and shake you out of the immersion you may experience in the world that is presented. This may very well have to do with the translation, and not the initial intent of the writers. I would go as far as calling the dialogue very strange at times, although I cannot know for sure what is to blame; the dialogue itself, or the translation. While this may be jarring, please try to understand that many things may have been lost in translation, and after a short little while, the awkwardness becomes charming and begins to feel like a part of the overall experience. Weapons take a key role in the customization of your character. A weapon is divided into three parts: a guard, a blade, and a hilt. Each part has its own power, and can be combined to create a weapon that fits your playstyle. The main components of the weapons have skills, and when equipped, your character may utilize those particular skills. Once you accumulate enough AP and Master that portion, you learn the skills and may use them regardless of the weapon equipped. Weapons can also be reinforced. Alongside Levels, you also gain Merit points every five levels which are used to customize your characters and strengthen them as you wish. This does not seem to have a very large effect on the gameplay and battle early on, but it is more visible much further into the game. Overall the customization of the characters is more focused on the weapons and the three components, as well as the corresponding skills you may learn from them, rather than the Merit point distribution. An added element that makes this game wonderful is a fortune teller by the name of Rooshay, who will tell you your next objectives should you forget or skim through the dialogue too quickly. While this may seem trivial, it is an added bonus if you play this game while you commute and put it down for an extended period of time; it refreshes your memory and it saves you the trouble of running around aimlessly talking to every npc in the hope that one of them will give you a clue as to where to go next. A concern that many people have regarding mobile gaming is the terrible touch screen controls that try to emulate a joystick and often fail. That is not the case with this game. The joystick emulation in this case is very well done, and you won’t be getting stuck against trees and npcs trying to weave your way through them. Touch screen controls will never feel as great as an actual controller does, nor be as accurate, but I have no complaints about this issue pertaining to this game, and feel that Symphony of the Origin has one of the best UI’s and controls to date. For those of you who hate random encounters, rest assured. The monsters all appear on-screen, and the battle will commence only once you touch them. 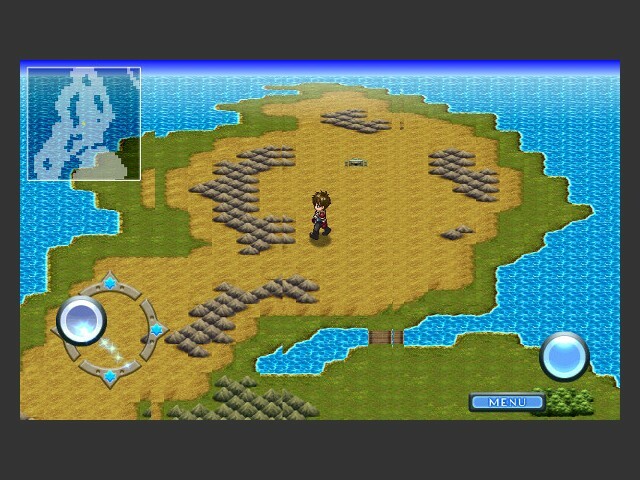 The battle system itself is very much what you would expect from a traditional RPG. You select your actions, and you select your target. There is also an Auto feature that allows you to watch your characters do their thing and complete the battle without your input. This is wonderful if you are attempting to grind and do not wish to do so manually. The Auto feature does well enough against regular monsters, so you do not have to worry about it being a death sentence like it usually is in other games that have it implemented. This is also an added perk that I appreciate on a mobile game. An Armor Value is present in boss battles, which represents the boss’ armor durability, much like an HP bar does. This armor will break once you damage it enough and deplete the Armor Value bar, which changes their appearance and affects their combat capabilities. This adds a very interesting element to the battle system in terms of strategy. Symphony of the Origin is an open-world RPG, much like the old SNES RPGs were at the time, and there are numerous side quests that can be completed throughout the game. Your quests are not quite obvious at first glance, and they will not pinpoint you to the area you must go to complete them, which is another great feature that will be appreciated by fans of old RPGs. There are two settings available: normal and hard. You may choose whichever you wish when you start a New Game. I found the game quite easy, and it does not require too much grinding at all in order to progress through the story. I found several bosses that could be demolished by using the Auto function, and the AI did perfectly fine without my input. This may be a perk for those who do not like the turn-based fighting system, as they can still enjoy this game and everything it has to offer without having to pay attention to every single battle if they do not wish to. I take a very old-school approach when it comes to DLC as well as in-game shops. I expect to receive a full product, and I am one angry gamer when DLC is on a disc already and you must pay in order to unlock it…however, I take a different stance with mobile gaming. SOP are points you purchase which can be used to unlock dungeons and areas within Symphony of the Origin, and are a nice addition to the game if you would like to experience everything it has to offer. These points are NOT necessary, and you can enjoy the game completely without purchasing any. This game is not like many other mobile games out there that force you to buy certain things and items in order to make the game and difficulty bearable. Do not be turned away by this. It has absolutely no negative impact on your gameplay at all, and only serves to enhance it should you choose to purchase SOP. This game should keep you busy for MANY hours depending on how you approach RPGs in general, and is dependent on whether or not you purchase SOP points. A lot of the dungeons in the game can be opened and unlocked by purchasing these points, and thus your playtime will differ significantly depending on that variable. I personally enjoyed the game, and it is a huge leap forward in terms of mobile gaming and mobile RPGs. 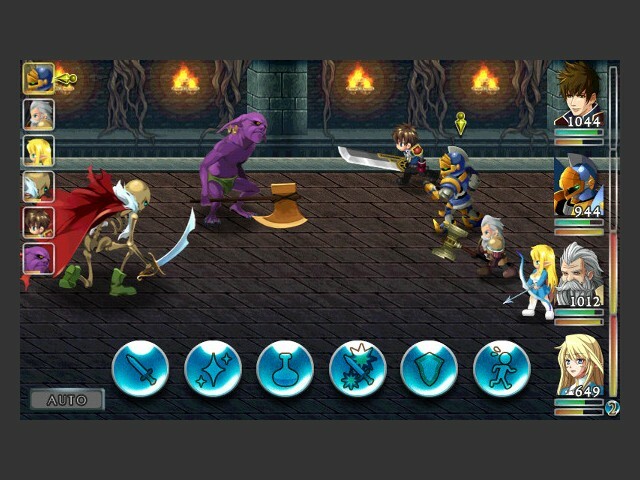 If you are looking for a great RPG without the ridiculous price tag seen on many titles that are nothing but old games ported on to the mobile scene, then this is the game for you. It is well thought out, gorgeously executed, and a joy to play. The characters and the interaction between them is worth the money alone, and the RPG experience this game has to offer is both refreshing and rewarding. Mobile gaming, especially in the RPG scene has a long way to go and some very big shoes to fill, but KEMCO has bridged the gap between Mobile RPGs and Console Quality RPGs a little more, and that makes me hopeful for the future of Mobile RPGs in general. KEMCO has done a great job with this game, and we are looking forward to many more! Former Volunteer- A girlie gamer that likes long walks on the beach, vanilla flavoured ice cream and...I lie.